1 of 5 Line a cookie sheet with parchment or waxed paper. Cut 6 of the large white marshmallows in half crosswise with clean scissors. Insert a lollipop stick into center of uncut side of a marshmallow half and push it about 11/2 inches onto stick. Thread a pink and then a whole white marshmallow, flat side onto lollipop stick, pressing them to marshmallow half. Make sure end of stick remains covered with whole white marshmallow. Cut a corner from opposite sides of whole white marshmallow to create a triangle for Santas hat. Transfer stick to prepared cookie sheet. Repeat to make 11 more sticks. Cut mini marshmallows in half crosswise; set aside. 2 of 5 Place red candy melts in a small microwavable bowl. Microwave, stirring every 10 seconds, until smooth, about 1 minute. Dip top of a marshmallow assembly in red candy to cover just the white triangular marshmallow, allowing excess candy to drip back into bowl. Return stick to cookie sheet. Place a mini marshmallow half, cut side down, at top of coated marshmallow. Repeat with remaining marshmallows and candy. Transfer cookie sheet to refrigerator until set, about 5 minutes. 3 of 5 Spoon vanilla frosting into a ziplock bag; press out excess air and seal bag. Place white sprinkles in a shallow bowl. 4 of 5 Snip a small (1/8-inch) corner from bag with vanilla frosting. Working on one stick at a time, pipe a thin wavy line around edge of red candy and press sprinkles into frosting. 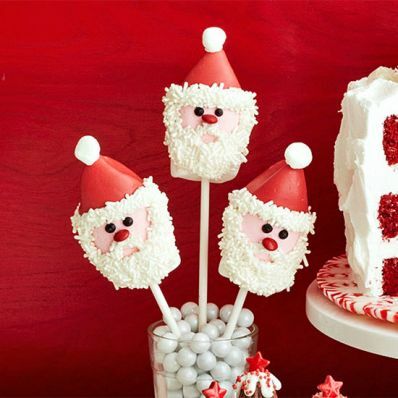 Pipe Santa's beard, hair and mustache onto marshmallows and gently press sprinkles into frosting. Adjust any stray sprinkles with a toothpick, if necessary. Add a red M&M's for the nose and pipe 2 eyes with decorating icing. Press stick end into styrofoam. Repeat with remaining sticks. 5 of 5 Arrange finished sticks in a cup filled with candy. Cover styrofoam with candies, if using.